Apples have played an integral role in American life for the past 400 years. They were brought here mostly as seed by the first Europeans. The colonists planted orchards everywhere they settled. It turned out that apples loved American soils and climates. They provided home-grown fruit nearly year-round long before the days of highways and super markets. The first fruit could be picked in late July and the last fruit could be stored in root cellars until June. Different apples were perfect for fresh eating or for pies or sauce or cakes, breads, cider, vinegar, molasses, butter, animal food, and so forth. Every area had its own locally adapted favorites, especially Massachusetts where close to a hundred superior selections were named and introduced before 1900. Throughout the country over ten thousand varieties were named by the mid-nineteenth century. These are what we call now “heirloom” or “heritage” apples. Each has a unique story and each plays a role in the long and wonderful agricultural history of the United States. Originated in Wilmington, MA, about 1740. Also called Butters Apple or Woodpecker. Discovered on the Butters Farm by a surveyor planning the Middlesex Canal and noted as a favorite site for local woodpeckers. Massachusetts’ most famous apple. By 1850 Baldwin was the standard all-purpose home and commercial variety throughout New York and New England. Hard deep-red crisp juicy fruit ripens in late fall and keeps in storage until spring. Originated in Esopus, Ulster County, NY, 18th century. A choice late-fall dessert and culinary apple, mentioned in nearly every list of best-flavored varieties. Slightly tart, crisp and juicy. Famous for being Thomas Jefferson’s favorite apple. Medium-large bright-red round to mostly conic fruit. Excellent acid source for sweet or fermented cider. Uncertain origin but thought to be from England, New York or New England. Grown throughout New York and New England for many generations. The champagne of cider apples, ripens late in fall and keeps well into spring. Also famous as a dessert fruit. Round medium-sized fruit with deep yellow golden russeted skin. Originated in West Virginia and thought to be the parent of “Golden Delicious”. All purpose medium-sized roundish yellow fruit ripens in mid-fall and keeps until about the first of the year. Although popular throughout the South, it was also traditionally grown throughout much of New York and New England as far north as central Maine. Originated in Roxbury MA in the early 1600s and thought to be the first named American apple variety. Medium-large greenish fruit mostly covered with russet. Famous for dessert and cider, ripens late in the fall and keeps in storage until late spring. Together with Baldwin and Rhode Island Greening, one of the big three commercial apples in New England for much of the nineteenth century. Originated in Penn Yan, NY around 1791. 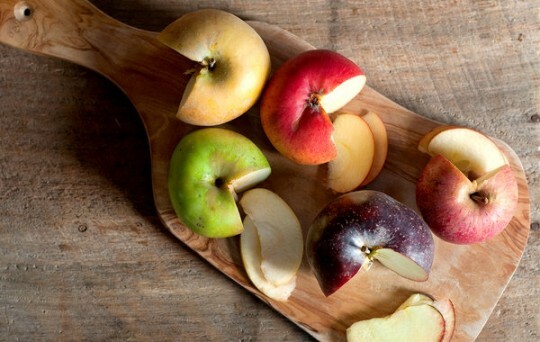 A great all-around apple for eating fresh, baking, or making cider. Apples have thin, glossy green skin that can be flushed with red. White flesh is crisp and tender with some excellent tartness, somewhat similar to Northern Spy in taste. Harvest goes into late fall and stores well. Originated in Westfield, MA before 1796. An excellent dessert apple for fresh eating that also stores well. The medium-size apple has firm, crisp flesh with a wonderful, slightly acidic and complex flavor. Thick skin tends to be very muted yellow with some russet blush or stripes. Especially likes very well-drained soil, not heavy wet clay. Ripens in late September and early October.